Ribbit King Plus! 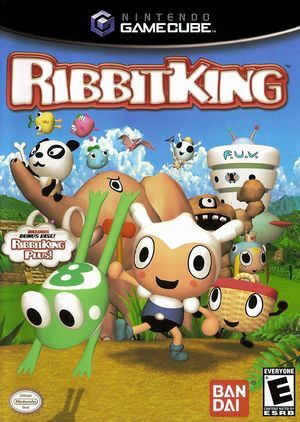 (aka Kero Kero King DX Plus (ケロケロキング デラックス プラス) in Japan) is the bonus disc included with North American versions of the Ribbit King, featuring unlockable short animations and requiring saved data on the memory card to be able to view the shorts. It was initially transmitted in Japan as a 30-episode series of shorts on the TV Tokyo weekday morning children's show Oha Suta from 16 June to 25 July 2003 to promote the Japanese version of the game, before being released on a separate DVD at around the same time as the Japanese PlayStation 2 version of the game. Three of the shorts were dropped from the North American version for unknown reasons. Exclusive to the disc is a two-minute video titled "Special", a montage of the various cutscenes from the story mode set to the main title theme of the game. Since at least 5.0-6243, the fade out at the end of cutscenes will flicker. This can be fixed by setting Texture Cache Accuracy to Medium. The graph below charts the compatibility with Ribbit King Plus! since Dolphin's 2.0 release, listing revisions only where a compatibility change occurred. This page was last edited on 29 July 2018, at 08:09.